Two novellas about losing and finding God in unlikely ways. Both these stories by debut author Walker ask the question: If we ignore God, will he ignore us? In “Mack’s Destiny,” Macklin “Mack” McGregor is a pleasure-seeking man who was born into a Christian family, but he’s long since strayed from the religious path. His story alternates with that of his lifelong friend Destiny Harding, a single mother whose poor choices have left her with two children by two different men. She recently took a vow of celibacy until marriage—something Mack can’t understand—and she hopes to make better choices for herself and her children in the future. But the past keeps stalking her: Her ex-boyfriend Tucker tracks her down, determined to “see [Destiny] dead before he let anybody else have her.” As Mack develops feelings for Destiny despite himself, he also faces Tucker’s violent jealousy and anger. In the end, however, Mack’s attachment to Destiny might just save Mack from himself. The second novella, “Reva’s Journey,” explores similar themes. Reva Mitchell is on the run after she witnesses a shooting in a Detroit club. The police put her in protective custody, and she abandons her city life and heads to rural Indigo Beach, Mich., where a kind pastor named Deon and a born-again Christian named Melvin Harris offer her safety and inspiration. As she pieces her life back together, she encounters Destiny Harding (from the previous novella), who once more plays a pivotal role in helping a lost soul. These tightly written stories work best when they address the metaphorical dangers that a person faces when he or she loses his or her way. 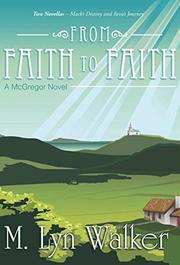 Each is well-written and exciting and they both offer adventure, surprises and messages of religious inspiration. These highly readable, thought-provoking tales will hit home with spiritually minded readers. Inspiring stories of people saving one another from physical and spiritual peril.